Dip into a world of puzzle delights, treasures, and adventures in this unique take on classic matching games! Explore 4 game modes, each with its own addictive qualities. Work your way through 40 levels in Adventure Quest, opening presents along the way. 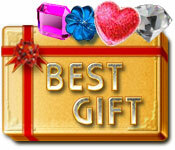 In Miracle Quads, you will find a brand new way to collect gifts. Challenge yourself with Fable Puzzle, as you try and solve 100 beautiful puzzles. And don't miss Amazing Action, where the puzzle fun never ends! Open your Best Gift today! Discover the Secrets of Grey Mist Lake! FBI Agent Claire Ellery has discovered another Strange Case and she needs your help!